Michael Noonan tells an audience in Berlin that senior bondholders in banks, or in the Irish state itself, will be repaid in full. FINANCE MINISTER Michael Noonan has told an audience of bankers in Germany that Ireland remains committed to repaying the full value of senior bonds in its banks and in the Irish state. Speaking at Commerzbank in Berlin, during his first visit to Germany since taking office, Noonan said Ireland had committed “to ensure that there is no private sector involvement for Irish senior bank paper [bonds] or Irish sovereign debt”. “This commitment has been agreed with the EU-IMF Troika and is now the basis on which Ireland’s future financing strategy is built,” Noonan said. The comments mark a slight policy shift for Noonan, who in November had said that while he was supportive of burning bondholders, Fine Gael had never promised to do so while in government. In the Dáil at that time, he had remarked that any programme of burden-sharing would require the support of the European Central Bank, which was “not forthcoming”. Noonan also told his German audience that the Irish state had reduced the cost of recapitalising its banks by €16.5 billion, largely through burden-sharing with junior bondholders and securing private investment in Bank of Ireland. “There are at present very important discussions taking place among European states on a new treaty which will include a ‘fiscal compact’,” the minister said. 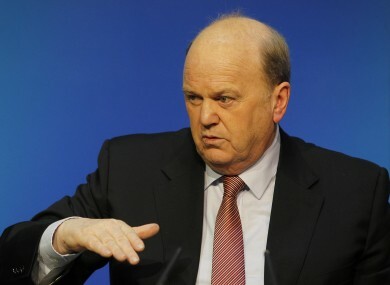 Noonan will meet German finance minister Wolfgang Schauble in Berlin later this evening. Email “Noonan assures German bankers: 'Ireland will not burn senior bondholders'”. Feedback on “Noonan assures German bankers: 'Ireland will not burn senior bondholders'”.